Free as in Free Hugs, not as in Free Beers ! You use Firefox... or not ? You know what is Free Software ... or not ? You know what is a Free Hug ... or not ? First day of the summer, last day of exams' period for most students, we will take the occasion to organize a Mozilla Event: a Free Hugs party. 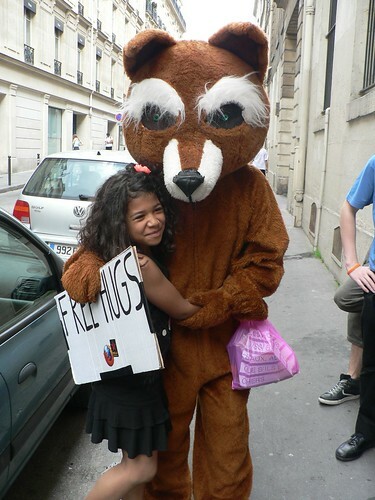 In Paris, place de l'Odéon, on Saturday, at 3:00 p.m., we invite everyone to come, learn what is a free software and especially what is Mozilla Firefox. And the firefox will be there !!! So don’t have any hesitation to come and invite your friends: the more, the merrier ! FOSDEM (Free and Open source Software Developers' European Meeting) is a free and non-commercial event organized by the community, for the community. Its goal is to provide Free and Open Source developers a place to meet. The event take place in Brussels, Belgium, 6th and 7th February 2010. For more informations: http://www.fosdem.org/2010/. As last year, I will be there with the Mozilla Team, my aim for this year is to work on Women & Mozilla project (WoMoz). Oh My God, I just been flashed by Kaze and Delphine. No way, I can't run away. Give the 5 websites you find useful, or that you use the most. Try to explain why! GeekInc: my Firefox start page. I'm a redactor on this blog but I really like watching podcasts and reading articles of my colleagues. French speaking only. Standblog: best author about standards on the Web, an amazing "boss"and somebody I admire. Both English and French. April: a French association working for promoting and protecting Free Software. Twitter: I'm a Twitter addict, I use this website to do technologic-watched. Reecently, I tried Identi.ca, Free Twitter-like, it's better but there is less persons on it. TellMeWhere: a website where you can find restaurants, pubs, note them and share them with your friends. Really easy to use, in French and in English. Mitchell Baker: I think it could be interesting to know what is her favorite websites. Pascal Chevrel: because you were my favorite internship's responsible and a friend. Jono Bacon: I'm reading The art of Community and I like it. Dédicace: Delphine, je te zut.